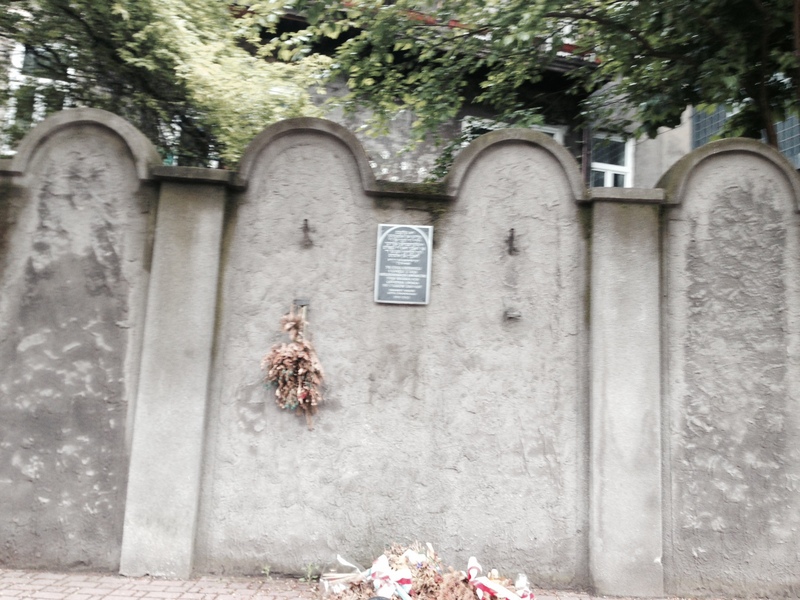 I have really been struggling to figure out how to write about our second day in Poland, which started with a trip to the ghetto established by the Nazis in Podgorze, across the river from Krakow, and ended with a trip to Auschwitz. We had an incredible guide, Tomasz Cebulski from Polin Travel. He is a scholar in the field of the history of Polish Jewry and the Holocaust as well as an articulate, thoughtful, and sensitive person, and he wanted us to understand on a deeper level the methodology used by the Nazis during the Holocaust. Without Tomasz and his way of preparing us for Auschwitz, I do not think we would have fully appreciated the horror of what we were seeing. Having said that, there is just no way that I can do the same for anyone reading this post. Most of us have seen photographs; we’ve seen movies and read books about Auschwitz. Many of us have been to Yad Vashem and/or the Holocaust Museum in Washington. We think we understand what happened there. But we don’t. Even being there, I still don’t. The more you learn about it, the less you understand. What we learned from Tomasz was how ingenious the Nazis were in using psychology and technology and the instinct for greed to enlist not only Germans but citizens of other countries including France, Austria, Hungary, and Poland into their program for annihilating the Jewish population of the world. And Jews weren’t helpless sheep being led to the slaughter; they also were the victims of the Nazi propaganda machine and its use of psychology to create the impression that somehow all would be fine in the end. Corporations like IBM and many others saw the opportunities for making fortunes in developing the technology and equipment needed to facilitate the operation of the Nazi death machine. Jews were also used as slave labor in the companies of many industrialists; Oskar Schindler was the exception, doing something to protect these people who were being forced to work in his factory across the river from Krakow and close to the concentration camp at Plaszow, which we also visited. And the world sat back and let it happen, pretending that things could not be that bad, that focusing on the war effort itself was sufficient, and that there really could not be such things as death camps. That a place like Auschwitz could not exist. Are we any better today? Just as the Jews could not believe that they would be slaughtered like animals but that things would be okay in the end, so do we all. We delude ourselves over and over again into believing that we can’t do anything to stop genocide, just as the world did during World War II. We bend to the profit motive, and we buy into propaganda. We forget, and we move on. But Auschwitz is still there. Although the other death camps were destroyed by the Nazis when they realized that they were losing the war (see Note below), Auschwitz survived more or less intact. The Nazis did bomb the gas chambers and the crematoria, but there was enough evidence left to show the world what happened there. And the fact that the Nazis made one serious error—placing the gas chambers and crematoria adjacent to barracks for concentration camp prisoners who could witness how they were being used—also ensured that history would not allow the Nazis to cover up their satanic ways completely. Auschwitz is still there. You can stand on the watchtower, and you can see the foundations of hundreds of barracks almost as far as the eye can see. You can see the crematoria, the remains of the gas chambers, the barracks, the train tracks. You can see the confiscated property of the people who were killed there—glasses, suitcases, clothing, ritual objects. Their hair and their prosthetic devices. The glass case exhibiting baby clothes made me weep. The clothes of children younger than my grandsons—evidence of the complete evil of these animals who watched babies get carried to their deaths with their mothers. More than anything else, that devastated me. How do you walk away from this and still have faith in humanity? How can you have hope that good and beauty and love will prevail when there is so much capacity for evil? How can you ever trust anyone to be compassionate, fair, understanding? You just have to. Because it is just too painful to think that people can be so evil. Because in fact most of us are good and loving and compassionate and fair. Because we have no choice but to see the beauty and the love and the hope or we would all just give up and fall into the darkness. We have to walk away, and we have to get up the next day and embrace life. Otherwise, the Nazis and all the other evildoers in the world defeat us. Yes, we need to stand up to evil. Yes, we cannot close our eyes and hide. But we also have to go on seeing the good in each other and loving each other as best we can. Important Note: Although the other death camps were substantially destroyed by the Nazis to hide their genocidal activities, there is a movement to preserve the limited remains of the Belzec death camp in eastern Poland. You can read about that project here. It’s in German, but you can use Google Translate to read it in English. There is some urgency as the property is to be sold at a public auction on June 22. Please help preserve this place as another reminder us of our potential for evil and our need to fight against it. UPDATE: Due to public pressure, the auction has been cancelled, and the money already collected will be used for preservation. The organization is no longer collecting donations. 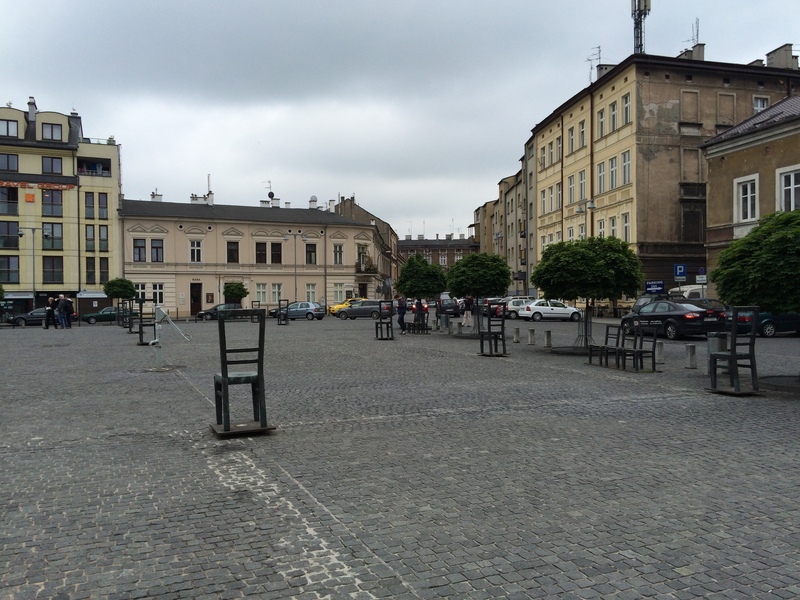 This entry was posted in Galicia/Poland, Holocaust, Travel and tagged Auschwitz concentration camp, Kraków-Płaszów concentration camp, Krakow, Oskar Schindler, The Holocaust, World War II, Yad Vashem by Amy. Bookmark the permalink. This post is very moving – I can’t even begin to comprehend what it would be like to stand there. Being at the Holocaust Museum was more than I could bear. Thank you for sharing this! Thank you for reading and sharing your thoughts. I really appreciate it. While I have visited a number of these places I did bot have the maturity to come to grips what I saw. I am indebted to you. Today I know that life was always hard. Today I know that Joy makes it possible to find some comfort in life and the sorrow makes each moment of relief ever more precious. Today I know you decide to devote yourself to things that are interesting to you–and drag the sorrow with you rather than let it block your way.. What a mid you have! What a gift for all of us.. I need some ice-cream. SHARON, DO YOU WANT TO GO FOR ICE-CREAM?! THIS TRAVELING ALL OVER YESTERDAY IS EXHAUSTING. Thank you, Herb. Some of my ability to see the bright side comes from what I learned about Judaism from you. Lactose free ice cream, please! Amy, I don’t believe this will not happen again. ISIS is already on its way. The Chinese would destroy previous dynasties that included families, friends, distant relatives, art work, buildings and other items important for a culture to remember. Robert Cantor wrote a book 16 years ago called the history of the world. He recalls the dynastic genocide in China. History is written by the victor. Let’s hope we are on the right side of history so that his will not happen on the grand scale again. I worry about this also, especially ISIS these days. But I have to believe that the world can and must do things to stop these evil forces. Thanks for reading and commenting, Alan. Thanks, Amy. 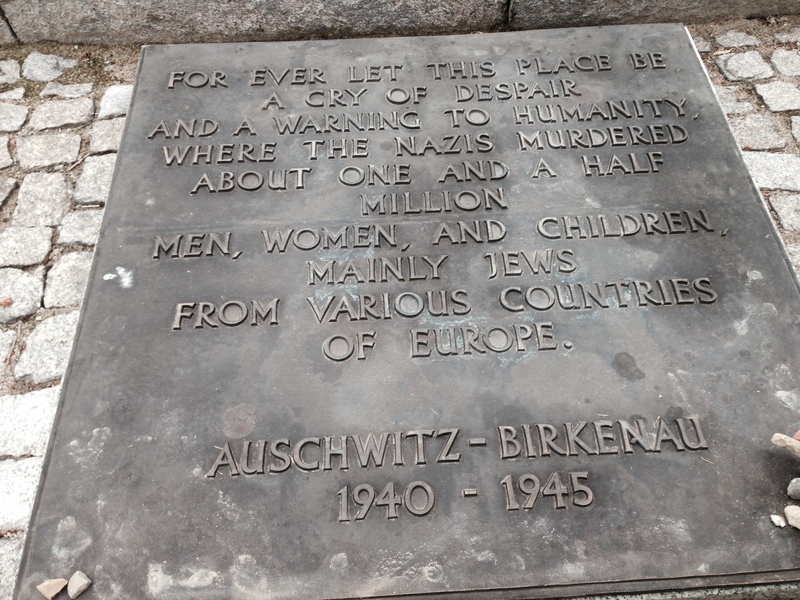 I have been to this death camp and the horrors and atrocities although hard to see, are so needed to keep educating people, and your blog helps do just that. In many European countries, like France, young schoolchildren are taken here, so that the past does not become the future. I have a distant cousin who comes with his school system every year. Thank you for the photographs, too. Amy, this is one of your most powerful posts. I hope you share this story (and the link) far and wide. Education plays an important part in combating hatred. Thanks again. I did get quite a few hits on the post—-much more than usual. I am not that good at the publicize end of blogging, so if you have other suggestions, let me know. You can use StumbleUpon to draw traffic. Don’t forget the Jewish collaborators that helped maintain Nazi order and helped the Germans make sure the Jews were loaded onto trains to the death camps. Also worth remember are all of the non-Jewish victims of the Nazis including the first people to be killed at Auschwitz, the Poles. Now we have to keep a watchful eye on German attempts to whitewash history. They have been trying to unburden themselves of their historical legacy though a number of means such as making the Germans out to be the victims of WWII, the ascribing of responsibility for the Holocaust to the Poles by using terms such as “Polish concentration camps” (even the NYTimes did this as did Obama), teaching their young softer versions of the history. We have to be sure to keep the blame where it belongs and stay faithful to the truth and resist ignorance, resentment, and revisionism where it occurs. You make some good points, but to call any Jew a collaborator with the Nazis is just offensive. Yes, some Jews did awful things in order to survive, but who are we to pass judgment? How do we know what we would have done under those circumstances? I had a male French relative who cooperated with the Vichy French. For the next few years after WWII until his death, many people in his town crossed the road rather than encounter him out walking. Thank you for sharing the story. I imagine that there were many families torn apart as some did the right thing and others did not.